Close Your Eyes And.... (aka Bois de Gaïac et Poire, aka Ref. 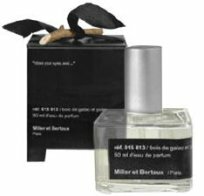 015 813) is the latest fragrance from Miller et Bertaux. The notes include lemon, mandarin, jasmine, roses, gaiac wood, pear, cinnamon, heliotrope and almond. Miller et Bertaux is a French niche line, and their first three fragrances were all unusual and very much in the niche tradition. No. 3, Green, green, green and green happens to be one of my very favorite (you guessed it) green fragrances. I also like gaiac wood (a few examples of fragrances with gaiac wood: Le Labo Vetiver, L'Artisan Bois Farine, Ormonde Jayne Orris Noir, Serge Lutens Miel de Bois), so I was excited about Close Your Eyes, or Bois de Gaïac et Poire, or whatever its official name is. In the event, the fragrance fails to move me. It starts with citrus and sweet fruit, and moves into a lightly powdery, vanillic woods. It is not overly sweet, and the gaiac does start to add some depth after an hour or so, but it stays unexpectedly pale — this is a cozy comfort sort of scent as much as anything, and one that could have been quite easily released by a mainstream brand. Marina at Perfume-Smellin' Things compares it to "another hazy disappointment, Kenzo Amour", but I have to put in my two cents in defense of the Kenzo. Kenzo Amour is also a comfort scent, and like the Miller et Bertaux, it has a kind of purposeful blandness, but the Kenzo has more personality, and the thanaka wood there does what the gaiac fails to do here: anchors the sweet notes and keeps the composition from sinking into lethargy. If you loved Close Your Eyes, do comment and tell me what I'm missing! Regardless, I am saving money all over the place this year and that can't be an all bad thing, although I'm still weeping over Paprika Brasil. The bottle is a new design for Miller et Bertaux, and the price has doubled for this one: $100 for 50 ml of Eau de Parfum (Nos. 1-3 were each $100 for 100 ml). At the moment, lusciouscargo appears to be the only retailer in the US that has it in stock. I agree completely! I really like all the other MeB scents–and I LOVE Green, etc.—and I also like Gaiac wood, so I was very excited about this release, and then–meh. . . Oh well, as you said–money saved. The SA in Barney's explained the fact that none of our group liked it much by saying it was meant for men; of course, that wouldn't stop us, but do you know if it's true ? (didn't seem likely, but ya never know; she wasn't generally well-informed, though). I liked this well enough and ALMOST bought it, but in the end, I didn't. I found the roses very prominent and lovely amid all that wood and citrus. It's one of those that could be fabulous if tweaked just a little. M. Miller, are you reading this? Entirely agree, L, in fact, I did lots of tweaking in my mind. More rose, more gaiac, a touch of spice (where is that cinnamon?) and leave out some of that pear, please. And welcome back to reality, by the way! Hope it hasn't been too jarring to be back in the US of A. Agree. It's linear and sort of characterless. Barney's has it now, too. Yep, guessing it is the thanaka, which I think is lovely, but of course one person's lovely is another's stinky Without it, Amour would be completely dull. Thanks I, I forgot Barneys even carried M&B. It made very little impression on me. Not at all what I expected from a guaiac wood scent. That stuff is super potent. I liked it, it had a nice soapy, clean smell to it, but it just didn't make me pull out the credit card, which is not that hard a thing, but the price tag on it really put me off too, it just seems really high for what it is. True enough, although even with a different name this one wouldn't seduce me. It is very expensive, and I'm hoping this isn't the early warning of a price hike at M&B. But sounds like you liked it much better than I did, at any rate! Hey, at least you're having your disappointment in Art with Flowers, LOL, where there are so many other fish in the sea! And we agree again. Despite the Kenzo thing. I would even concur that EVEN Kenoz Amour has more personality that this one.